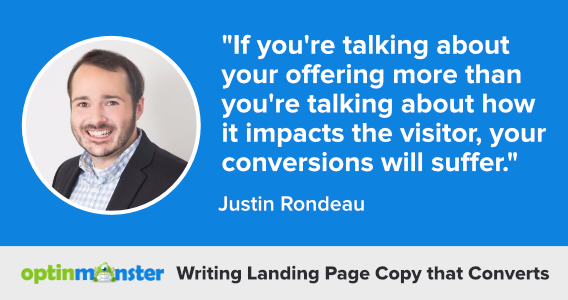 Are you worried about writing landing page copy that converts? Having a landing page that works is an essential step in converting visitors to leads, so it’s important to get the copy exactly right. What’s your top tip for writing high converting landing page copy? What conversion-killing landing page copywriting mistake do you see people making and how can they avoid it? As you’ll see, they provided some excellent advice on mistakes to avoid and gave tips you can use today on writing landing page copy that converts to help you really nail your own landing pages. 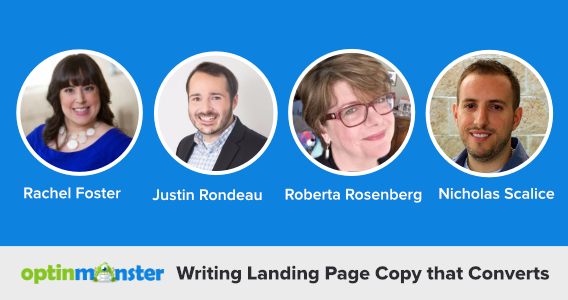 Before we dive in to our copywriting tips, we’d like to introduce you to our experts. Rachel Foster is a B2B copywriter who helps marketers improve their response rates, clearly communicate complex messages and generate high-quality leads. She has taught copywriting for MarketingProfs and was one of the Online Marketing Institute’s Top 40 Digital Strategists of 2014. Justin Rondeau is the Director of Optimization at DigitalMarketer and leads product innovation at TruConversion. He specializes in optimizing marketing campaigns and digital experiences to help grow businesses. Connect with Justin on Twitter. Roberta Rosenberg is the Director of Marketing, E-Commerce & Social Media for the American Council of Engineering Companies (ACEC), a Washington-DC trade association. She’s been a practitioner and teacher of all things direct marketing for 30+ years. Connect with Roberta on LinkedIn and Twitter. Nicholas Scalice is a growth marketing consultant and the founder of Earnworthy. He specializes in landing page design, A/B testing, and conversion optimization. Connect with Nicholas on LinkedIn and Twitter. Roberta Rosenberg: Prospects only care about your product/service based on what it will do for them – in short, they’re buying an outcome, not a product. (I’m not buying mascara; I’m buying long, flirty eyelashes to look attractive. Mascara is the channel to the outcome.) Use that to build the core of your copy and guide your messaging approach. If you can do this, then most of the heavy lifting is done. 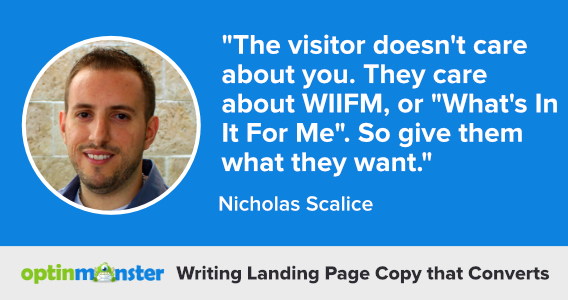 Nicholas Scalice: My top tip for writing high converting landing page copy is to always start with in-depth persona research. Far too many landing page designers and copywriters jump right in and begin writing what they think will work. But they haven’t done the proper amount of research to get into the minds of their target market. Frankly, they might not even know who is in their target market! Therefore, you should always start by doing a qualitative analysis, and gathering feedback that you’ll use to create a persona for each segment you want to talk to. Then, once you’ve identified their specific pains, motivations, preferences, etc., you can write as if you were speaking directly to them. Also, split test your button copy to see which words bring you the highest conversions. Justin Rondeau: Make sure to tailor your content based on the source. Use personalization techniques to maintain message consistency from ad to landing page to get a nice bump to conversions without having to kill yourself over new copy (just model the ad copy you already created). Nicholas Scalice: One of the biggest conversion-killing mistakes I see is talking too much about yourself, or your company, on a landing page. The visitor doesn’t care about you. They care about WIIFM, or “What’s In It For Me?” So give them what they want! Write your copy in a way that speaks to the motivations of your audience. Don’t get hung up talking about your accomplishments, awards, expertise, etc. If you want to highlight those things, let them come up naturally in your testimonials from your past customers or clients. Justin Rondeau: Another big faux pas comes from pages that are more ‘I’ centric versus ‘You’ centric. If you’re talking about your offering more than you’re talking about how it impacts the visitor, your conversions will suffer. 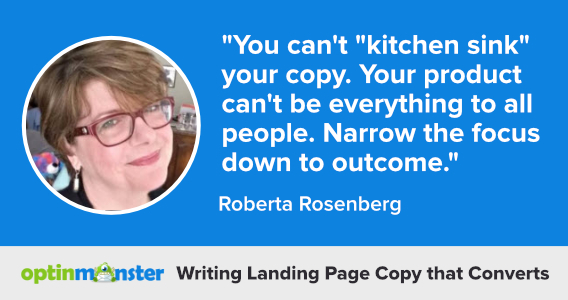 Roberta Rosenberg: Even if your client wants you to, you can’t “kitchen sink” your copy. Your product can’t be everything to all people. Narrow the focus down to outcome – what’s the benefit, why act now, what’s in it for me. Stay obsessively focused on the specific prospect’s need for ‘relief’ and the optimal solution they’re looking for. 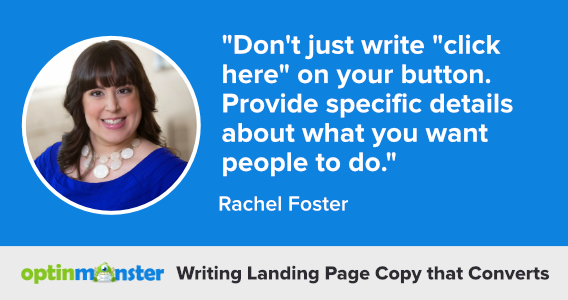 Rachel Foster: The biggest mistake that I see with landing pages is long, boring copy. If you want someone to download free content or register for a webinar, you don’t need much text. Your headline does a lot of the heavy lifting on your landing page, so spend extra time on it. I recommend using CoSchedule’s free headline analyzer tool if you want to make your copy punchier. It analyzes your headlines, grades them, and suggests ways you can make them stronger. I use this tool for almost all of my headlines and blog post titles. Justin Rondeau: People often use catchy headlines over headlines that provide clarity. In most cases they use the headline for hype and the subheadline for expansion. This is 100% backwards. Your headline can (and should) be both exciting and informative. Good copywriting, especially when it comes to headlines, finds the balance between the two. Too informative – you lose the visitor because they don’t know how the offer applies to them. They know who you are and what you do… but that’s it (and it won’t be enough). Too exciting – you’re all hype and no substance. You talk about the benefits & end results but are unable to ground the visitor. And don’t miss our next expert roundup. Follow us on Facebook and Twitter to be the first to know when our articles go live.